Ricardo Jardim Gonçalves, Full Professor at FCT NOVA, leads two European projects totaling € 38 million, making FCT NOVA the largest Portuguese institution to coordinate H2020 funds. 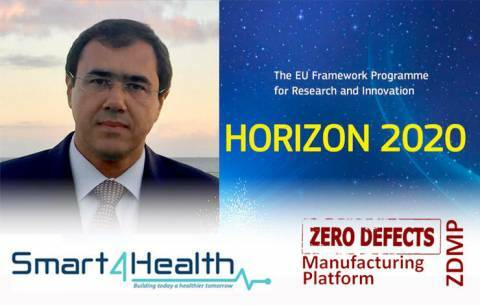 The Smart4Health project has just won € 22 million under the Horizon 2020 European Research and Innovation Program. It aims to serve in the interoperability and globalization of the European health data bank and aims to respond to the needs of citizens to manage their own health, empowering custom solutions in this domain. It is also the European response to the strategy of Digital Transformation and support for social Innovation. "Smart4Health will radically and globally change the paradigm how health, wellness and care services are provided," says Ricardo Jardim Gonçalves. The second project, with an investment of 16 million euros, is the Zero Defects Manufacturing Platform (ZDMP) that will develop a digital platform to manufacture defect-free products, allowing factories to achieve excellence in manufacturing. The pilot phase of this project involves the participation of 5 Portuguese industrial companies, thus enabling the Portuguese industrial manufacturers with production and innovation excellence. The project leader, who also coordinates the GRIS research unit of the Center for Technology and Systems (CTS) at the Institute for the Development of New Technologies (UNINOVA) of NOVA University Lisbon, states: "These achievements reinforce UNINOVA's solid international reputation as FCT NOVA institute for excellence in research and development at international level".